Ministry of Railways Jobs 2018 Latest Offers Vacancies for the Positions of Deputy Manager / Finance & accounts, Assistant Manager / Legal, Assistant Manager / Marketing, Assistant Manager / Real Estate Development & Marketing, Assistant Manager / IT. These posts are to be based PUNJAB Lahore. The aforesaid Jobs are published in Express Newspaper. Last Date to Apply is November 19, 2018. 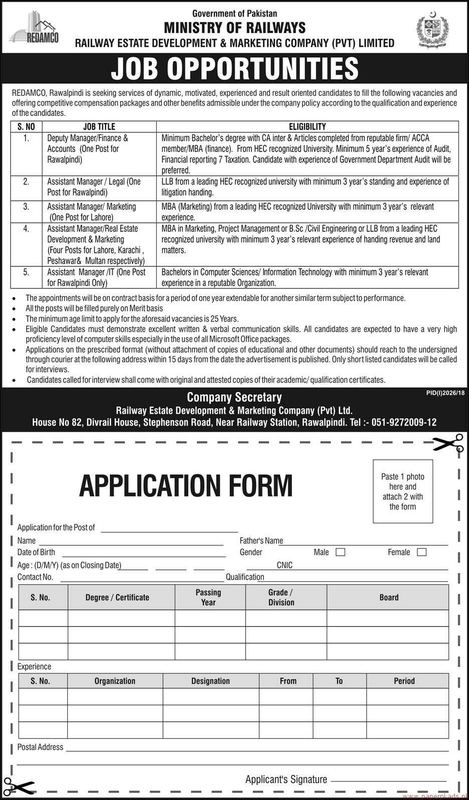 More Details About Deputy Manager / Finance & accounts, Assistant Manager / Legal, Assistant Manager / Marketing, Assistant Manager / Real Estate Development & Marketing, Assistant Manager / IT See job notification for relevant experience, qualification and age limit information.